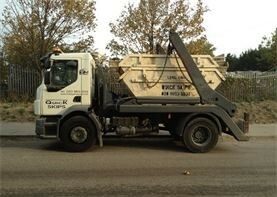 Turn to Quick Skips London Ltd for dependable skip hire services in the Orpington, Kent, area. For skips on the road, we can provide a permit from the local council as an approved skip hire company. We also offer delivery construction materials in bulk. In addition to hiring out skips and grab lorries, we supply a range of high-grade products for the construction and landscaping industries. We supply soils, chalk, and recycled aggregate with an extensive range of materials that are delivered to our business and domestic customers. We help businesses streamline operations since we remove waste at the same time we deliver products. This minimises vehicle movements and proves more cost-effective for the customer. These are not brands but type-one crushed concrete and topsoil. Customers love the quality of our soil. Contact us in Orpington, Kent, to find out more about our efficient skip hire services and our construction materials delivery.